I’ve since learned that typically in Nebraska, March comes in like a lion and acts like a lion all month and goes out like a lion and greets April like a lion and once in a while a little lamb pokes it soft little head out just long enough to tease the lion. But this year the lamb appears to be a bit more feisty than the lion because the sun is shining and we’re having some unusually warm weather. The boys have been going outside in shorts because they can. We’ve been shooting hoops in the driveway with the sun in our eyes. Awesomeness. For the first time in months, a smoothie sounds good, especially after playing or working outside. But then we come back into my house and guess what? Brrrrr! The house hasn’t caught up yet with the outside weather. What should we expect? It is still getting pretty cold at night. So sweaters or shorts? Flip flops or boots? Iced coffee or hot? Soup or smoothies? 1. THE SUN IS SHINING, even during the cold parts of the day. I heart sunshine. I’ve probably mentioned that here before. 2. I can enjoy baking and grilling at the same time. This doesn’t happen in the winter or the summer. 3. There are no bugs yet because they haven’t yet realized that it’s warm enough to come out and crawl on us. 4. Soup and smoothies taste good together. Today I present to you, in honor of The Month of Crazy Weather, our favorite soup and smoothie recipes. You just never know when you’ll need one or the other or both at the same time. 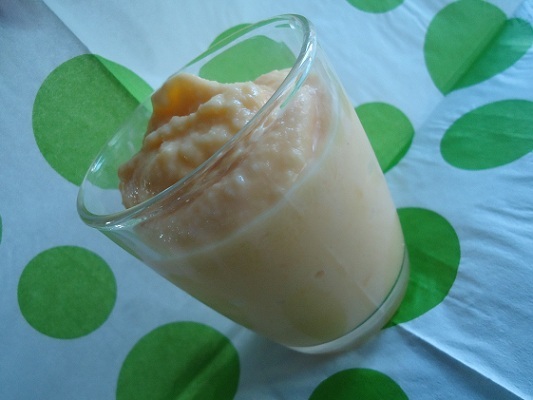 While looking through my archives, I realize that I actually have very few smoothie recipes here. That’s because I just throw in whatever fruit we have, which makes smoothies at our house “non-recipe” items. What are you experiencing at your house? Lion or lamb? Soup or smoothie? Boot or flip-flop? I also need to make Ranch Salad Dressing Mix. We go through that super quickly! Parts of my house desperately need cleaning, plus we are gearing up for a big bathroom remodel!! And, I’m working every spare minute on a new Healthy Snacks eBook. It’s finally starting to come together, which means I’ll be able to share it with you soonish. 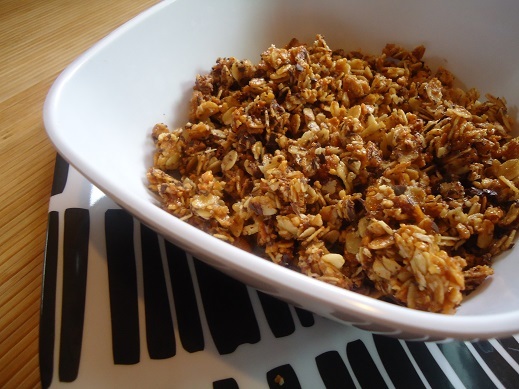 This snack recipe and so many more are coming right up! What are you up to this weekend? Planning to have some down time or hoping to be super productive? Maybe a little bit of both? Time to Bottle Your Vanilla! Did you make homemade vanilla extract for Christmas gifts this year? Your friends and family will be so blessed! If you’re ready to bottle it up, I wanted to share my favorite online resources. If you live in a big city, you may be able to find something less expensive. Since I don’t have that option, I take advantage of the good ol’ internet. Just before posting this, an email came through saying that you’ll get free shipping at Olive Nation with a minimum order of only $25 – now through November 19!! Take advantage! Use the code FREESHIP25 at checkout. 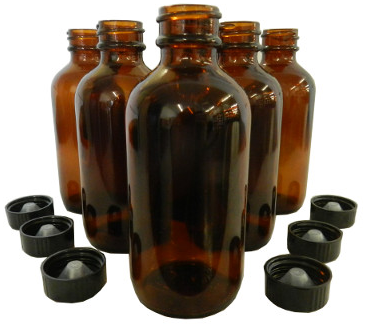 If you want 2-ounce or 8-ounce bottles, I recommend Mountain Rose Herbs. Don’t let the cost of bottling your vanilla discourage you! Your homemade vanilla is still an inexpensive gift, especially when you consider the quality of what you’re gifting! Also, don’t be afraid to ask the recipient to save the bottle to give back to you. Most people have given their bottle back to me without being asked (and some beg for a refill – of course!). For those of you who haven’t jumped into making Homemade Vanilla Extract, you’ll be excited to know that we have a big batch of our homemade vanilla almost ready to bottle up and share with you. This will be just in time for your holiday baking and/or gift giving needs! Mark your calendars for Saturday, December 6 so you won’t miss out. If I thought I couldn’t keep up before with all that must be done each day, somehow I am finding it even harder now that our lives are so full of teenage activities. Throw in the fact that our oldest is a senior, and all that goes along with making decisions for next year, applying for scholarships, and taking college level classes. I officially surrender. I am beat. Except that I’m not, because God is in control (not me! ), my family is awesome, and if all else fails, I can buy a pizza. I’m writing down my weekend plan here to share with you. On Sunday, I’ll try to share an update on what I’ve accomplished. Finish the Menu Planning Notebook – and upload it to my Shop – finally! Doing those tasks, along with getting some writing done and maybe tackling my email inbox (yikes!) should help me keep my head above water next week. How about you? What will you be doing this weekend? You know why I love taking meals to families who have new babies? Is it because I’m so servant hearted, loving, kind, and eager to bless these tired families? Oh please. It’s all about me. Really. You should know this truth. Blah, blah, blah – here’s your food, hope you like it, I made it just for you, now where is your darling newborn? Yeah. I love babies. My babies are of the much taller, lankier, and less snuggly variety now. I love them dearly – even more than when they were newborns. Who knew that was possible? It just is. But given the opportunity to cuddle a newborn, and you know, give the tired mama’s arms a break (that’s me being graciously servant-hearted again, what-ev-er) – I take it. Sweet, sweet babies. I love them. Taking a meal to a family with a newborn means that there are blessings all around! Tired parents don’t have to cook, older siblings get some special attention, and I’m sorry, did I not already make my point clear? I get to hold a newborn baby. Blessing upon blessing. No doubt many of the foods listed in this post are great to take to others for reasons other than a new baby in the house (surgery, loss of loved one, illness, loss of job, or any other trying or exhausting situation). By all means, please use this list to take meals to anyone who might benefit. However, this post offers suggestions specific for the family who has a new addition. Stay away from hot peppers. Mom might be avoiding spicy food if she is nursing. Check to be sure you are accommodating any allergies or dislikes the family may have. Ask what time they prefer you deliver the meal. If there are young children in the home, be sure to take foods that are easy to eat and typically enjoyed by kids. We’re trying to make Mom’s job easier, not harder. Give lots of attention to the baby’s older siblings when you deliver the food. Consider taking a little treat just for the “big brother(s)” and/or “big sister(s).” This could be something like 100% juice boxes, mini muffins, or even something non-edible like a new coloring book with crayons or a matchbox car. Fresh fruit is always so refreshing after just having a baby. Ask what kind of fruit sounds good to Mom and pick some up to take along. If you are able, it might be fun to take a little something extra for a quick and easy breakfast for the family to enjoy the next day. See list below for ideas. If possible, take your food in dishes the family won’t have to wash and return to you. Breakfast items like Easy Breakfast Casserole can be a fun change of pace for dinner. If you have extra time and resources, you can bless the family by taking along some Dark Chocolate Almond Granola or Giant Breakfast Cookies – something easy for them to eat in the morning after a sleepless night. 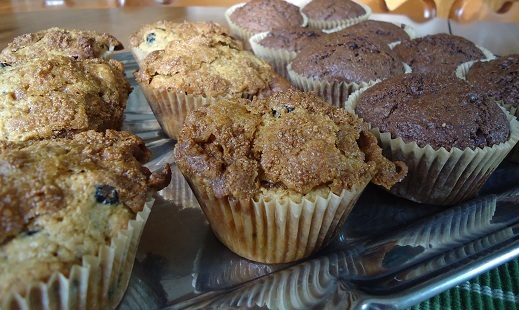 Muffins and other breads are always fun to receive. 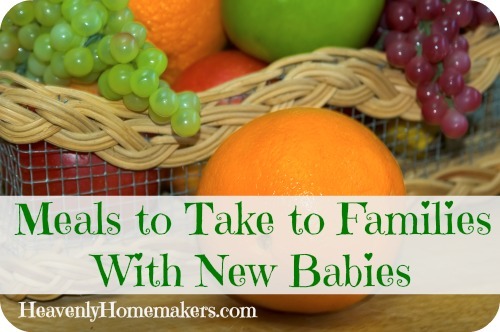 What are your favorite foods to take to families with new babies? I’m sure there are items you would add to the list. Matresses, cribs, car seats – there are many items that are worth buying new. Sometimes, it’s even worth paying more for an item so that you can be sure you’re getting good quality, thus saving money in the long run. So, go shopping we did. We were met at the door of our locally owned appliance store and shown wonderful, beautiful, shiny new washing machines. We were given all the details about their bells and whistles, and were provided with many convincing reasons for why we should buy the top of the line (especially with our four active boys). They sounded great, actually. But the price tags? Ouch. Thankfully we have a line item in our budget for spur of the moment necessity purchases. But did we really need to spend that much on a fancy appliance, or would a less than the best still do the trick for us? We really wrestled with this. When is it important to buy high quality, and when is it okay to go with a lower quality, lesser price? Ugh, and we really needed to make the decision quickly, as the laundry was piling up at home as we stood in the middle of the forest of washers and dryers. Our heads feeling as though they were in spin cycle. <— Clever, huh? I thought of that one all by myself. Before looking much harder at the new washing machines, we asked to be taken to the back to see the used appliances they had on hand. This store has come through for us many times with their used items. 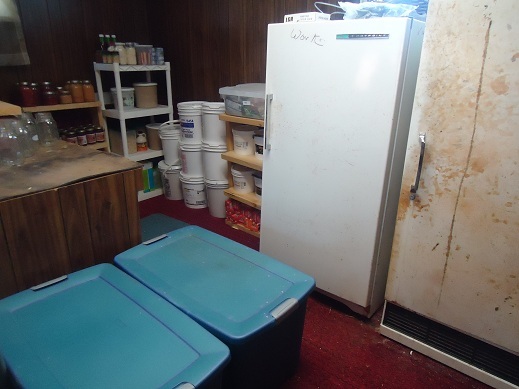 Remember my used upright freezers? Ugly though they are, they serve their purpose and sit in our storage room where no one can see them. We were happy to pay a huge discount because they were used and ugly. They’ve worked great for years! One used washing machine really caught our attention. It was everything we really needed, much of what we wanted, and because it was a few years old, it was less than 1/5 of the price of the brand new ones. We asked question after question, we grilled them about what might be wrong with it, we stuck our heads in and looked for whatever people look for when they stick their heads inside a washing machine. We listened again to the spiel trying to influence us to buy the new washer which was five times more expensive. We went home, we prayed, we looked at all the dirty laundry. We quickly came to the decision that the used washer was really all we needed. Writing the check for that was barely even painful. We got such a great deal! It was delivered and installed the next day. A few years old, a couple of scratches, and if you look real close, you’ll see my reflection since I was the one taking the picture. That came free with purchase. 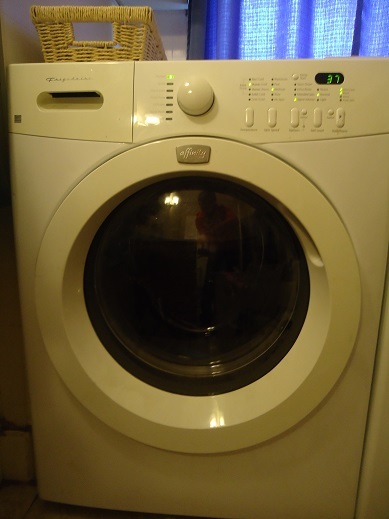 What has been your experience with buying used appliances? Is there anything you feel strongly about that should always be bought new? Drop kick it with me, friends! I despise these expectations we think others are putting on us that we most likely are really putting on ourselves. Want to see what I made my family for our Sunday Dinner today? So let’s consider: Since I bought a pizza from the store to feed my family for lunch, am I a homemaking failure? Since my new/used washing machine just got installed yesterday and I have yet to use it or clean up the mess the delivery guys left all the way down the stairs while they took out the old washer, am I a homemaking failure? Since my dishwasher was broken and I pulled out the paper plates for our company on Saturday morning, am I a homemaking failure? Sigh. I’m pretty sure I am. Woe is me. I failed to be perfect. I may as well throw in the (dirty) towel. 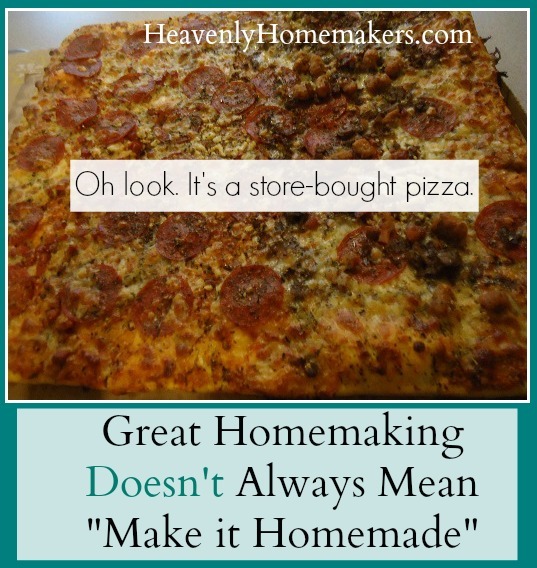 Homemaking is homemaking – no matter what it looks like. My heart is for God and for my family. I always work hard and do my best. Today, my best looked like a store bought pizza. Today, I blessed my family by feeding them, worshiping with them, and cheering them on at soccer. Joyfully, I have a case of toilet paper on hand so that I can check that off my list of mama emergencies. 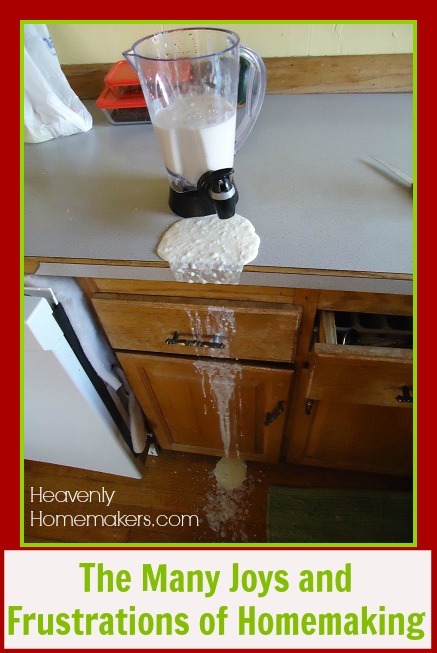 Homemakers…unite! Bring your imperfections, your crusty nosed kids, your broken appliances, and your unmade beds. Be empowered to keep on doing what God is calling you to do. Keep working hard, loving your families, and rocking this homemaking thing. And if my closet door is ever open when you come to my house, please look away very quickly and act like you didn’t see a thing. 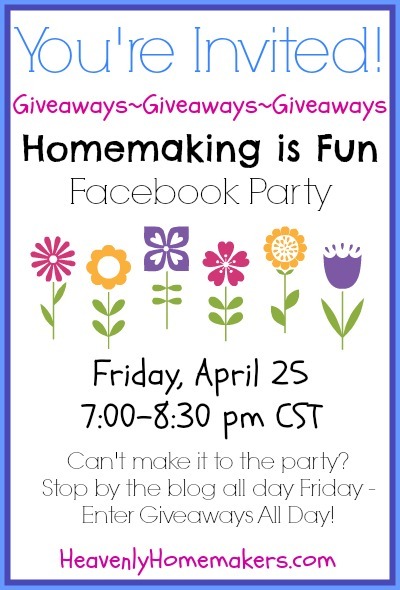 As we focus this week on remembering that Homemaking is Fun, I want to encourage you with some posts from the archives. ~ This one speaks for itself…So, You Don’t Like to Cook? Matt only knew my paternal grandmother for a few years before she died. One of his favorite memories of her is the response she gave after being told that extra people were coming to join us for a meal. “Great! I’ll just add more water to the soup,” she said with a chuckle. Seeing as we weren’t having soup that day, he then watched in amazement as she “added water” to stretch the meal she had prepared. Grandma seemed to make more food appear out of no where, and in record time, too. The table was soon filled with all varieties of goodness. The little bowls of this and the small dishes of that didn’t look like they would feed the number of people we were anticipating. But sure enough, just like the loaves and the fish, Grandma had enough to fill us all with twelve (give or take) baskets left over. What was Grandma’s secret? Well, she just always had a good supply of food on hand. And not just frozen meat that would take hours of time to thaw and prepare. I’m talking about home-canned fruits and vegetables, homemade bread and cookies – food that she could pull out and feed people in a moment’s notice. This Sunday, I was blessed with the opportunity to “add water to my soup.” We already had plans for another family of 6 to join us for lunch after church. Their 6 plus our 6 would equal 12. (Thank you, Laura, for stating the obvious.) I was making a roast, carrots, potatoes, and gravy. My friend was bringing rolls. It would be a simple, nothing-fancy, but tasty meal. Then, at the last minute, a friend of my brother’s family needed a meet-up place here in Nebraska. The friend would come here, my brother’s family would drive up from Kansas and pick him up, and guess what? They’d make it in time for church. Bliss! I got to worship with my brother and his family of 6 and feed them all afterward! So let’s see here. Six plus six is twelve, plus six more – that’s 18. Then there was my brother’s friend who was meeting us by lunchtime. Did I mention he was a 6’8″ college athlete? And last but not least, a friend of Elias’ needed a place to hang out after church while his family headed out of town. That made a total of 20 people. Super fun. Thankfully, I had decided to make two roasts instead of just one – just in case. I had loaded the roasting pan with potatoes and carrots. I caught my friend (the one already planning to come over with her family) between class and worship, filled her in on the crazy, and asked her to pick up extra rolls – plus maybe a bucket of ice cream? She was happy to help stretch our meal. Once I got home after church and started making gravy, I also started a big pot of green beans and another big pot of corn. Our simple meal remained simple, yet because there were so many different foods to choose from (roast, potatoes, carrots, gravy, rolls, green beans, corn, ice cream), it looked like a feast. We had plenty to go around and even a little bit left over. Phew! If you’re opening a can or jar, I suggest pouring its contents into a nice serving bowl to make your “spread” look tasty and welcoming for your guests. Did you grab a bag of prepared salad on the fly? 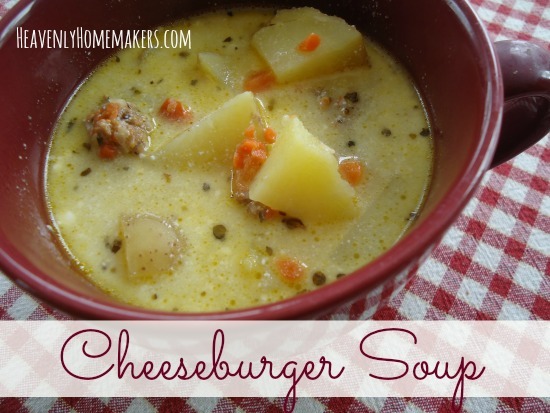 Pour it into a bowl and throw in some grape tomatoes to make it pretty. Don’t hesitate to ask your guests to pick something up at the store on their way to your house (especially if they offer or ask what they can bring). Most of the foods on the list above take little to no prep time, but will stretch your meal and offer your guests a delicious variety. What would you add to this list? What have you found works well to stretch a meal to feed extra people? I thought I was going to gag. I almost got a headache. My lungs got tight. I’m not exaggerating. Elias (my 11 year old) was with me, and he started to feel queasy. We were there only about seven seconds. Where had I taken my child, you ask? To aisle nine. We were simply walking down the cleaning products aisle at the store. I avoid that aisle at all costs. But that particular day last week, I needed one item – an ingredient to make a homemade cleaning product. Go figure, after those seven seconds of torture, I still couldn’t find what I was looking for. Elias asked, “Mom, why is that aisle so disgusting?” Obviously, I’ve avoided taking my kids there since my eleven year old didn’t know that it even existed. If found it hard/ironic/frustrating to explain that all of those products that seemed so nasty to him are offered for sale to help us get our house, dishes, hands, air, clothes, furniture, bathroom, floors, and windows clean. I’m all for getting rid of the dark cloud of dirty sock scent that hovers over my boys’ room. But when did “clean” begin to smell so toxic? And why are there so many hundreds of varieties of cleaning products to choose from? Do I really need twenty-seven separate products to clean approximately five major areas of my home? Must we all keep a large cabinet full of sprays, bottles, drops, powders, and scrubby bubbles in order to be fully equipped with everything it takes to keep a house clean? Absolutely not. Be relieved and take a deep breath (but by all means, get out of the cleaning aisle first so that you don’t pass out). I’m inclined to ask, “What would Grandma do?” I spent hours at my grandma’s house, helping her cook and clean. Try as I might, I can not remember where in the world her cleaning cabinet was. This leads me to believe that she didn’t have one. She wouldn’t have seen the value of spending money on a variety of different cleaning products when her home naturally had everything she needed. In fact, as long as I can remember, she made her own bars of soap. If I close my eyes, I can still smell it. Mmmm, there’s nothing toxic about it. In fact, it didn’t have much of a scent at all. It only smelled…clean. I’ll admit – I don’t make my own soap. Instead, I have found some great online resources for a few products I trust for our skin, hair, laundry and dishes. As for cleaning my home? Well, I don’t find that it’s very complicated really. There’s nothing like good old water. Norwex products are awesome. And the best? Baking soda and vinegar. 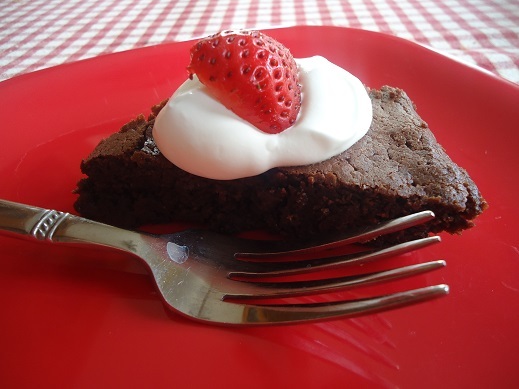 I found a great online resource, sharing 27 Ways to Clean with Baking Soda. Not to be outdone, here’s a post I found called 1001 Uses for Vinegar. I’m guessing Grandma knew many of these tricks, because she knew that getting her home clean didn’t require that she spend much money or use toxic chemicals. I’m guessing, actually, that she never gave thought much to toxic chemicals – she simply used what she had, and she knew how to keep her home clean. Ahhh, fresh, clean, and chemical free. That’s what I call cleaning your home naturally. I know many of you have knowledge on this topic! Share your tips and ideas. 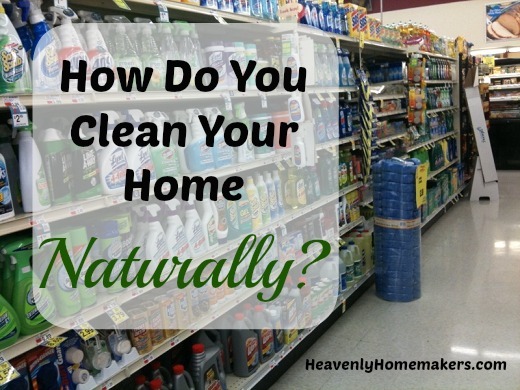 How do you clean your home naturally?